The island of Bali is blessed with the line of beaches surrounding it. On the southeastern side of Bali, Sanur beach is easily reachable from Denpasar, about a 5 to 10 minute drive. Sanur is an excellent site to watch the sun rises, as you jog along the white sandy beach. Being one of the first resort developed in Bali, Sanur maintains its traditions. Only a stone thrown away from the beach, ancient temples stand as solemn as they have been in centuries past. Practically on the opposite side of Sanur, the beaches of Kuta and Legian stretch on the southwestern side of Bali, again only about 5 to 10 minute drive from Denpasar or the airport. Surfing is a major activity in these beaches. Shops, Kecak dance performances, pubs, and other facilities make Kuta a tourist mecca. Jimbaran is directly south of the airport, on the way from Denpasar towards Nusa Dua. 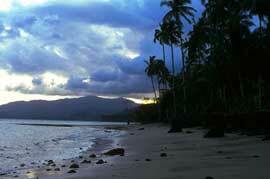 The village of Jimbaran is the narrow neck of the island of Bali, and thus it has two remarkably different beaches. On the west, Jimbaran Beach faces the Jimbaran Bay, recently lined by new luxurious resorts. On the east, the beach faces the body of water sheltered by Benoa Harbor. Nusa Dua is a new luxurious resort area where the world’s most sumptuous hotels gracefully integrate into the beautiful white beaches. Crystal clear water provides excellent snorkeling and diving site, and the waves on the northern and the southern part of Nusa Dua allow for great surfing opportunity. Further northwest from Denpasar, on the way to Gilimanuk, the ferry port town that connects Bali and Java, there is a small quiet beach called Soka Beach. Continuing along the path towards Gilimanuk, near the village of Pulukan, the beach of Medewi is another beautiful beach. Near the northern tip of the island of Bali lies a stretch of villages by the Bali Sea. Lovina Beach is the name. It is well known as an excellent site for sunset watching, snorkeling, and diving. Night life activities are also abound, as well as chartered boats to go out into the sea. If you like what Kuta offers but do not like the crowd, Lovina Beach is for you.